The Vivo Y17 is coming soon. Although recent reports revealed that the phone will be named Vivo V5. However, a new report from 91mobiles reveals that information reaching them from a reliable source said that the phone will be Vivo Y17. So soon, the Vivo Y17 will be announced in the country. Below is what we know including the image and specifications of the upcoming Vivo Y17 smartphone. In terms of design, the handset will be coming with a gradient blue color. It will feature a triple rear camera arranged vertically with an LED flash. There will also be a fingerprint sensor placed on the center for security. The Vivo Y17 will come with a waterdrop notch display with small bezels around it. The top selling point of the device is the AI triple rear cameras and fast charging technology. The Vivo V1901A/T number that appears in TENAA will feature a large screen display size of 6.35-inch. The octa-core processor on the inside will be running at a speed of 2.3 GHz. It will be powered by Helio P35 SoC with an ample RAM of 4GB. It will be preloaded with the latest Android 9.0 Pie operating system with FunTouch OS UI on top. The inbuilt memory will be 128GB and a smaller model will be available with 64GB which will be expandable via micro SD card. The triple rear cameras will consist of 13-megapixel along with 8-megapixel lens and 2-megapixel third lens. For selfies, it has a front camera of 16-megapixel. Booting the phone is a massive nonremovable battery capacity of 5000 mAh. 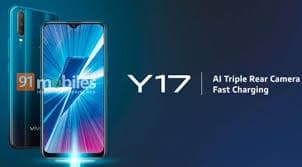 The Vivo Y17 is set to launch in April this month. So the release date is around the corner. On the price, the handset will be available in India at a price of Rs. 16,990. The same phone might also be released in China as well.